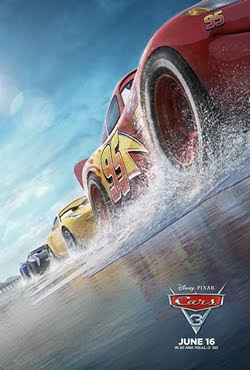 As the movie opens, Lightning McQueen is working his way through the Piston Cup season when a new rookie sensation Jackson Storm bursts onto the scene. He's arrogant, equipped with cutting edge, ultra modern racing technology and represents the next generation of racers. McQueen and his buddies try his best, but Storm is soon joined by other next-gen cars and McQueen sees the old veterans get fired or chose to bow out gracefully as a new generation of racers take the scene. McQueen is stubborn and tries his best but in the last race of the season he tries to overtake storm, loses control and has a violent crash. Flash forward four months later and McQueen is still recovering in Radiator Springs, watching old footage of Doc Hudson and trying to decide if he's going to retire or not. Spoiler alert: he decides he doesn't want to be forced out in a crash like Doc was and saddles up for the season once more. Rusty and Dusty, his Rust-Eeze sponsors (a melancholy moment when these two bow out of the movie given the passing of Tom Magliozzi in 2014) have sold out to a bigger company but have a fancy new racing center with all the trimmings for McQueen to train in and a new owner, Sterling who sets McQueen up with his new trainer Cruz Ramirez. McQueen has no patience for new methods of training and eventually gets impatient enough to jump on the simulator himself and wreck it in the process which leads him to strike a deal with the marketing and brand minded new boss Sterling: if he can win the first race of the season in Florida then he gets to decide when he retires, if he loses, then he'll retire and Sterling can cash in on the McQueen brand. So off Ramirez and McQueen go, getting back to the roots of racing to try and find an edge to beat Jackson Storm. They end up going to a Demolition Derby and then find themselves back in Doc's hometown where they meet Doc's old crew chief Smokey and some of his old friends- Lightning finds his racing groove again and they head to Florida for that race- but, spoiler alert! Lightning McQueen once again learns that winning isn't always the most important thing and they all live happily ever after.